Can I Catch Bass In the Late Spring Swimming A Jig? Most of us think of jigs as deepwater baits designed for fishing bottom, but for a short time in spring, jigs become topwater baits that are hard to beat, and they often produce some huge fish that are hard to catch with other lures. Swimming a jig is basically a postspawn tactic; the fish that have spawned in the pads, primrose vines and other emergent weeds remain in the shallows for days or sometimes weeks after leaving the beds, and they’re typically very hungry. The places they prowl may be anywhere from a foot to 4 feet deep, typically in the backs of the feeder creeks that make up the bays around the larger lakes across much of the southeast and west into Texas. The jigs that work best are not the heavy, fat models that work so well on the ledges. Swim jigs are flat-bottomed to help them scoot across the weeds, and are typically lighter in weight than those used in deep water, from 3/16 to ½ ounce, with large hooks designed to hold large soft plastic crawfish or swimmer tails. A nylon weedguard is also standard, helping to keep the single-hook lures from catching the cover. These lures are cast into cover near spawning areas-sometimes the shadows of the beds can still be seen in the cover. However, the fish may be some distance from the nests-they no longer guard them after the fry swim off on their own, but they do hang in the area to feed for a time. The trick in working a swim jig is to put the reel in gear instantly at the end of the cast, keep the rod high, and start the lure moving, slowly but steadily, just fast enough to activate the soft plastic swimmer legs or tails. Most anglers use either heavy mono, 25 pound test, or braid of 30 pound test or heavier, to allow pulling the lure free when it snags-and also to give them a chance to derrick large bass out of the thick stuff. The strikes tend to be sudden and explosive-it’s just short of the blow-ups inspired in fall by crawling a frog over the moss beds. The nice advantage of swimming the open hook jigs is that the fish more often than not actually get hooked, not the case with the weedless but sometimes also fishless frogs. Once a fish strikes, the tactic that works best is to set the hook hard, then crank as fast as possible with the rod high-ideally, you pop the fish up on top of the weeds and scoot him across them to open water. Of course, this plan is not always effective-they often bog down, and then the only way to get them out is to ease in on the troller, follow the line down and get a liplock on them. It’s also common for fish to blow up on the lures and miss them completely. When this happens, a second cast back to the same spot immediately often gets a second strike, but if not it can be useful to keep a Texas-rigged worm handy on the front deck. Cast the worm to the spot of the blow-up, bounce it up and down in the cover a few times, and you’ll often coerce the fish into taking. All colors of swim jigs work, but the ones that are easiest to see are the brighter colors-white, pearl or chartreuse are easy for you and the bass to spot. Fishing the swimjig is a short window in the fishing spectrum, but it’s one of the more interesting and productive tactics for big fish when the bite is on-give it a try this spring. 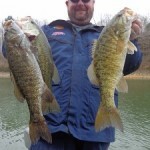 This entry was posted in Bass Fishing, How To Fish on April 30, 2014 by ronniegarrison. and the water temperature dropped from 63 degrees on Thursday to 56 Sunday morning. My truck thermometer showed 34 degrees when I launched my boat at 6:30 AM. Even with those bad conditions there were five limits of bass brought in. We had a total of 47 keeper bass weighing right at 77 pounds. Most were spotted bass which I think hit better under bad conditions than do largemouth. I managed to win with five weighing 9.79 pounds, Kwong Yu was second with five weighing 8.68 and his partner Steve Blackerby was third with five weighing 8.48. Toney Roberts placed 4th with five weighing 8.01. Dan Riddle had just one keeper, but it was a big one. His 5.91 pound bass was big fish for the tournament. Bass were caught on spinnerbaits, crankbaits and Carolina rigs. The largemouth bass Jim Berry and I found in shallow water before the tournament had mostly moved back out with the dropping temperatures and were harder to catch. The next Monday and Tuesday the Georgia BASS Chapter Federation Top Six tournament was at West Point. The three Griffin clubs, Flint River Bass Club, Potato Creek Bassmasters and Spalding County Sportsman Club each had six man teams fishing this tournament. Griffin fishermen had a tough time at the Top Six last week. Although everyone caught a lot of bass, 14 inch keepers were not easy to find at West Point for some of us. It seems easy, in theory, to catch just five keeper bass in 6 to 8 hours of fishing, but it isn’t always so. It took 10 bass weighing 30.64 pounds to win this tournament and 23.57 pounds to earn 12th spot on the state team. If you had 19.12 pounds you came in 25th and got a check. There were 86 clubs with six man teams in the tournament, so about 516 of us were beating the waters trying to catch bass Monday and Tuesday. Lee Hancock, fishing with the Potato Creek Bassmasters, was the highest Griffin area fisherman. He weighed in 13.76 pounds of bass in two days. Kwong Yu and Javin English, fishing with the Flint River Bass Club, had 11.74 and 11.69 pounds respectively, to lead that team. Jimmy Waddle lead the Spalding County Sportsman Club with 11.30 pounds and I had 11.19 pounds in that club. I finished 139th! The Top Six Tournament is quite and experience each year for the fishermen that qualify for it. I have been to 26 of them, missing only one since 1979. I was too sick to go to one in the early 1990s and hate missing that one. Members of each club are fishing now for points in club tournaments to qualify for the Top Six next year. It is not too late to join a club and try to make it. Maybe you can show us how to catch fish in that tournament next spring. This entry was posted in Bass Fishing on April 27, 2014 by ronniegarrison. How Did Missouri Wardens Find Missing Teen? The first thing Warden Supervisor Joe Jerich did when he found the shivering, wet missing 17-year-old canoeist in a remote area of Ozaukee County was think of what the teen’s worried mother needed. “I handed him my phone and told him to call his mom,” Jerich said. That was about 7:45 a.m. Thursday — about eight hours after a DNR Mission Ready conservation warden team responded to midnight calls to help a multi-agency effort find the boy who flipped his canoe in the swift waters of the Milwaukee River. The calls roused Jerich from his West Bend home, and Wardens Ryan Propson in Appleton and Sean Neverman in Sheboygan County. Within minutes, Propson, Jerich, Neverman and DNR Pilot Michael Callahan were on their separate ways to join other local law enforcement agencies and fire departments in their search to find the missing boy. They’re called Mission Ready warden teams – trained to answer calls for help at any hour and to stay with the mission until completed. The DNR Bureau of Law Enforcement has several of these specially trained teams ready to handle emergencies. In this week’s missing person case, the Tactical Flight Officer Team answered the call for assistance from the Grafton Fire Department in eastern Wisconsin. Propson wasted no time in leaving his home and headed for Wittman Regional Airport in Oshkosh, where the DNR has a plane equipped with a heat-imaging camera known as FLIR. Wardens and pilots have completed hours of training in how to use this camera from the skies to help find missing persons. He was joined by expert pilot Callahan, there to take command of the plane and get the duo in the air and to Ozaukee County — fast! Jerich and Neverman also were in high gear, traveling from their homes in their warden trucks to the search command post in Ozaukee County. The Mission Ready warden team added the DNR airplane, a warden boat and two trucks to the multi-agency search team involving the Ozaukee County Sheriff, Port Washington Fire Department, Grafton Fire Department and Mequon Fire Department. The mission? Find the kid. By the time the wardens were on site, five hours had passed since his mother last heard from her son. That was 8 p.m. Wednesday, just as his cell phone battery was dying and after he had flipped the canoe. And to add to the urgency, the temperatures were on their way down below freezing. Propson put his hours of training to work and manned the FLIR as pilot Callahan maneuvered the search flight route through the night sky. Jerich joined Neverman, who brought his flat-bottom boat, on land patrols while keeping in constant contact with other search teams and the DNR air team. So, instead of potentially causing yet another flipped boat emergency for even more emergency workers to handle, Jerich and Neverman stayed on land and separated. Neverman took off to search all the area’s water access points in case the boy made it to shore elsewhere, and Jerich joined the ground search, staying in contact with the DNR air team above using the FLIR to detect any and all heat sources below. A human body is a heat source. The wardens kept the land searches going until Propson and Callahan had to call it off around 3:45 a.m. Thursday. Propson said the mother of the missing person also knew he had not crossed a specific local bridge, which gave the air and land teams another landmark to plot search patterns. Then, the weather interfered with the FLIR. Two hours later, Jerich was back on the scene to handle foot and land searches guided by directions from the DNR flight crew overhead, flying this morning in a different plane with a different strategy. Fly lower. Callahan said within 10 minutes of starting the search, Propson spotted an aluminum canoe aground on the west bank of the river. The canoe was located in a difficult to access stretch of the river. But, it did look like it fit the description of the missing canoe. Propson and Callahan then directed Jerich how to drive to get to the general area, and then helped guide him on foot to the canoe through what was a difficult terrain — a flooded, mixed-forest area. “The plane crew directed me as close as I could get with the four-wheel drive truck and said the canoe is so many hundred yards in on foot,” Jerich said. Warden Ryan Propson texted success.But Jerich never made it to the canoe. “In short order, I came upon the boy who was in his green tent,” Jerich said. Propson was able to detect search personnel, animals and vehicles with the FLIR so the team knew the camera system had functioned properly. Back on land, Jerich said he was face-to-face with one very cold kid. How cold? The Weather Channel at weather.com shows the overnight low hit 23 degrees at 1:05 a.m. in Grafton and Cedarburg. And the missing teen did not have dry clothes to change into after going into the water. Still, Jerich said teen appeared to be OK. So Jerich gave him the phone and gentle directive to call his mother — now. At that point, Jerich radioed his success to the air team of Propson and Callahan, who then directed the land emergency medical teams to the tent site to handle transporting the boy to a local medical facility for evaluation. Neverman, who was on his way to join the search, got the call to turn around because of the happy ending. Up in the skies, it was a feeling of a job well-done and kudos to DNR Pilot Callahan for maneuvering a successful low pattern for Propson to spot the canoe and to guide Jerich to the boy. Jerich says this was multi-agency teamwork and cooperation at its finest, filled with many ready to help and to serve the public at split-second notice. The only thing that made it even better was finding the young man safe and OK in his tent. He was mighty cold, but he was safe. And he got to call his mom. This entry was posted in Fishing Ramblings - My Fishing Blog, Fishing With Family and Friends on April 26, 2014 by ronniegarrison. Fishing is complicated. There are thousands of lures and hundreds of jig heads to rig them on. It’s frustrating. Pro Angler Dustin Grice likes A-Rigs for targeting suspended fish, as well as those around structure. Selecting the best lure and jig head for the right technique can be overwhelming, in addition to figuring out the right weight of the jig head along with hook size and style. Jig heads don’t look complicated, but they are all different and made for specific techniques. Those designed for swimbaits are commonly used on castable, multi-lure rigs or combined with a soft plastic lure. FLW Tour angler Dustin Grice has put a lot of thought into what works best where and when. “Prime time to fish with the Alabama Rig, A-rig or castable umbrella rig is during the prespawn. Once the water temperature gets 50 degrees in the early spring it’s hard not to cast because of how many big fish it catches. The next best time is later on in October when the water temperatures begin to fall, however, you can still catch bass on it during the summertime offshore fishing ledges,” said Grice. When selecting lures to rig on his castable umbrella rigs, Grice matches the bait size. During the spring, he uses small-bodied swimbaits and changes to a larger profile as the bait grows during the year. Once Grice finds the right size, he will rig all of the jig heads with it. The double barb on this type of jig helps to keep the soft plastic tail in place during repeated casting. “Really, jig heads may be more important than lure size when it comes to catching fish on castable multi-lure rigs. The weight of the jig heads determine how deep the lure will run. 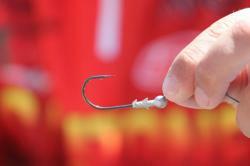 Hook size will determine what size lure to use. 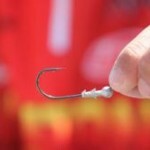 A castable umbrella rig has to be down in the strike zone to get a bite,” said Grice. 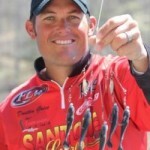 Grice acknowledged a large percentage of the time he uses 1/8-ounce Th’ Rig Head by Santone Lures on all five of the wire arms. Other times he will put 1/16-ounce jig heads on the top two wire arm and three 1/8-ounce heads on the remaining wire arms. He believes this keeps the castable multi-lure rig running true. A large percentage of the time, Tutt will rig 1/8-ounce jigs with 4/0 hooks on all the wire arms. 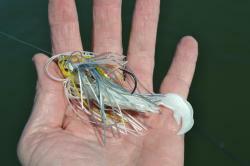 “I really don’t think hook size matters when a bass is going after a castable multi-lure rig. A bass is just trying to bust up the school,” said Tutt. What’s important to Tutt when fishing a castable multi-lure rig is his jig heads. 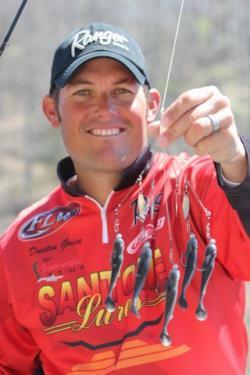 “I use the Santone Lures Th’ Rig Head. These jig heads feature a drop weight system that keeps the jig heads from wrapping up or tangling, round ball head giving the lure great side to side motion and a double-barbed model or over-sided screw lock model for keeping the lure in place,” said Tutt. Tutt added on solid bodied swimbaits the double-barbed model lures will stay on even without using super glue. On hollow bodied swimbaits, Tutt will put a drop of super glue to keep it in place. Both smallmouths like this one and largemouths are susceptible to the swimming “school” of bait represented by A-Rigs. “I use these heads because they have heavy duty hooks and when you are fishing with a castable multi-lure rig it’s not little fish you’re catching on it,” said Tutt. Th’ Rig Head double-barbed model is available in 1/16-ounce with 3/0 Mustad hook, 1/8-ounce with 4/0 Mustad hook, or 1/8-ounce with 5/0 Mustad hook and over-sized screw lock model in 1/8-ounce with 4/0 or 1/4-ounce with a 5/0 Mustad hook. In addition to using these heads on castable multi-lure rigs, Grice uses swimbaits rigged with them almost year round. His favorite targets with this combination are rocky areas and points. “On reservoirs like Beaver Lake and Table Rock, I will put on a 1/8-ounce head rigged with a swimming fluke Jr. and fish it everywhere there’s rock. I will tie on 6- to 8-pound test and fish it on a spinning rod. 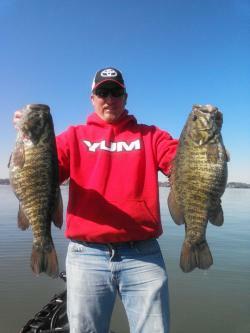 The spotted bass and smallmouth just love it when it’s reeled back in slowly,” said Grice. This entry was posted in Bass Fishing, Fishing Tackle, How To on April 24, 2014 by ronniegarrison. Jim Berry and I planned on fishing West Point on a Friday in early April but the awful weather that morning made us wait. We left my house at 12:15 and finally started fishing a little after 2:00 PM. It turned out to be a pretty good day even if short. We put the boat in the water and started fishing at the ramp since there were loons feeding on baitfish in the area and we saw activity. Anytime baitfish are in a cove there is a good chance bass are nearby, and they were. Jim caught a bass on a crankbait then I landed a 3 pounder on a spinnerbait. On a small point in the cove Jim caught two bass on a Carolina rigged Baby Brush Hog and I missed several bites. When I threw a Shadrap across the point I caught a small hybrid. That was probably what was hitting our Brush Hogs. Further down the bank Jim had a good bass hit and miss a buzzbait, then caught a keeper largemouth on the buzzbait. We went across the creek to another cover and Jim landed a nice keeper on the buzzbait. I hooked a strong bass by a stump but it jumped and threw my spinnerbait. I thought it was about 5 pounds but Jim said it was bigger, maybe 6 or better. As we fished into the next cove we started catching spots on our Carolina rigs and caught several. Around another point I caught two good spots, one about two pounds, on a Carolina rig then Jim pointed out some activity back in the cove. We went to it with the trolling motor and Jim started throwing a #5 Shadrap and immediately hooked a two pound hybrid. For the next half hour Jim hooked a hybrid almost every cast. I did not have as much luck throwing my #7 Shadrap – I think it was too big since the hybrids were feeding on small shad, but I caught four or five while Jim landed at least 15. That was fun while it lasted. Back out on the point Jim landed two spotted bass. Those were the last two fish of the day although we fished until dark. Not a bad afternoon, in five hours we caught 10 keeper bass, several throwbacks and about 20 hybrids. And the weather got nice, with no rain or wind while we fished. I owe Andy Lee an apology. After our trip to Oconee a week ago Friday I wrote about it that night. I guess I was too tired to think and for some unknown reason called Andy the wrong name. I am sorry for that mistake and below is the corrected information about our trip. Friday before last I took Zane Lee and his son Andy to Oconee for a bass fishing trip. Zane had bought the fishing trip at the Friends of the NRA Banquet, and I hoped we would have a really good day. And it started out that way. Andy caught two small bass on a spinnerbait the first cove we fished. At the second spot, I caught a small bass on a crankbait then Andy hooked the biggest bass of the day, a nice 3 pound fish. A few minutes later he hooked a bigger bass, one the looked to be about four pounds, but it came off the second time it jumped. A little further down the bank Andy caught another keeper fish on his spinnerbait, then added a throwback. At the next place we stopped I caught a small keeper on a Carolina Rigged Baby Brush Hog but then we went for about an hour without a bite before I caught two more keepers on the Carolina rig. By now it was after lunch and the morning cloud cover had blown away. Although we fished until 5:00 PM we did not hook another fish. I had lots of excuses, the clear skies made them stop biting, the crowds of jet skies and pleasure boaters made them quit biting, or I was wearing the wrong shirt. It must have been one of those things. We had a beautiful, if somewhat frustrating day. On the way home Andy was making his plans for killing a turkey Saturday morning. If he hunted as well as he fished Friday morning, he should have gotten at least two gobblers! On Saturday I got a call from Al Bassett, full time guide on Oconee. He had a trip that morning and they had similar luck to ours. Al said they started fishing in heavy fog and caught six or seven bass, then the sun burned the fog off and they did not catch a bass the last two hours they fished. Bass just don’t like bright sun sometimes! This entry was posted in Bass Fishing on April 23, 2014 by ronniegarrison. Should I Use Plastic Worms To Catch Spring Bass? Small, lightly weighted plastic worms are effective in hard-fished waters where power-fishing with fast-moving lures can be tough, says Yamaha pro Russ Lane. When Russ Lane gave up a promising baseball career to become a fulltime professional bass fisherman, he quickly realized he had to change his normal fishing strategies if he wanted to compete successfully against the best bass anglers in the world. The Yamaha Pro’s initial decision-looking for alternative lures-turned out to be one of the most important he’s ever made. Lane likes a little 4 ¾ inch worm that features a ringed body design but with a slightly larger tail. It has practically no action of its own, but the worm is still bulky enough he can rig with a larger 4/0 hook, quarter ounce slip sinker, and 22 pound fluorocarbon line. He uses a worm under 5 inches long on a size 4/0 hook, with a quarter-ounce slip sinker for casting weight. “It’s a finesse-type lure I can power fish with stronger tackle,” explains the Yamaha Pro, “and while it’s a great alternative lure throughout the spring months, it’s actually a very good lure throughout the year. I can pitch and flip it to boat docks, brush, stumps, practically any form of cover in water less than five feet deep. “I think it’s effective because the worm looks extremely natural in the water,” continues Lane. “Bass aren’t spooked by it because it’s not an intrusive or aggressive movement. I know bass hear the worm as it hits the water and then sinks to the bottom, but instead of darting away, I envision them swimming up to within a few inches of the worm while I’m letting it sit there motionless. An assortment of dark colors can be effective for spring fishing around beds where fish have recently spawned. This entry was posted in Bass Fishing, How To Fish on April 22, 2014 by ronniegarrison. 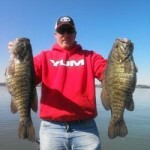 Can I Catch Southern Smallmouth On Swimbaits? Southern smallmouth bass can be tough to figure out. One day they’re here, the next they’re gone, but there’s one area where you can count on finding them almost year-round, the current-laden water that rushes through the dams of riverine impoundments. 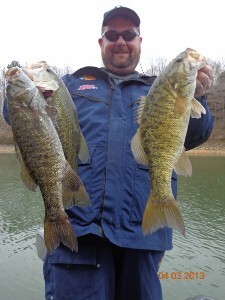 Captain Jimmy Mason shows a pair of enormous smallmouths taken in fast water below a TVA dam this spring.Mason says a swimbait tapping bottom now and then is the prime lure for catching bass of this size. I’ve been guiding on Tennessee River impoundments for quite a while now, and have seen new lures and techniques come and go. One that’s here to stay for this moving water is a swimbait. I’ve never caught so many trophy smallmouth bass like the ones in the accompanying pictures as I have on a soft plastic swimbait. Specifically, I most often use a 5-inch Yum Money Minnow in Foxy Shad color. It perfectly imitates our native forage, the threadfin shad. It is a simple lure and technique, but really catches bass in the kind of current we have in the Tennessee River and the upper reaches of my home waters, Pickwick and Wilson Lakes. I prefer fishing the swimbait on a ¾-ounce jighead with a weedguard to keep it from snagging. In fact, I’ve been using a Booyah Boo Jig and just removing the skirt. We’ve had abnormally cold water this winter and bass can’t fight heavy current in those temperatures, so they often sit in eddies behind boulders. I bring the swimbait right to the front of the boulder and pop it over, making it sink right on the fish’s nose. Sure, soft plastic swimbaits have been around for five or six years, but you don’t hear anglers talk much about fishing them in current. Even though it sounds simple, there’s more to being successful than meets the eye. 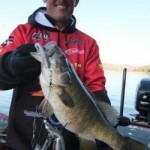 Smallmouth on the Tennessee River or any big river or tailwaters often scatter out over broad boulder-laden riverbeds. When I’m fishing swimbaits over these areas, I’m not fishing a specific spot. I’m letting the current carry the boat downriver and fishing multiple boulders or the bottom of the run-of-the-river section of the lake. You are fishing multiple low spots, high spots…anything that breaks the current, anything that these fish can pull in behind and set up in a current break. Current can undermine your presentation if you let it. I like to cast out and, much like I do when I am fishing an umbrella rig, let it “parachute” to the bottom. By that I mean I want to execute a controlled fall. To do this I turn my reel handle only slightly after the bait hits the water. I want that bait nose-down but under control as it falls to the bottom. As soon as I make bottom contact, I speed up my retrieve. I want to keep it just off the bottom. During the retrieve itself, I want to feel the bait bump bottom three or four times. I don’t want to bang bottom constantly, but I don’t want my bait to swim too far up either, because the fish are using the boulders and pockets for protection from the strong current. Feeling the bait bump three or four times lets me know that I am within a foot of the bottom as we drift. When I’m fishing these areas, I point the boat directly into the current and let it drift while I cast straight out. Keeping the bait in the strike zone during the retrieve is very important, and by casting directly in front of the boat and drifting straight downstream I’m able to fish the swimbait more effectively. Drifting in this manner, I can pretty much keep my foot off the trolling motor except to adjust the boat position. The objective is to keep the nose of the boat forward, pointed into the current. I want my bait and my boat moving backwards at the same speed. My casts are all perpendicular to the boat – at a straight 90-degree angle with the craft. I am not throwing upstream. I am not throwing downstream. I want to cast straight out so that my retrieve brings the bait straight back to the boat. The 5-inch Yum Money Minnow is large enough to whet the appetite of jumbo smallmouths like this one. As I said, my go-to bait for fishing in the current is the 5-inch YUM Money Minnow, more often than not, in the Foxy Shad color on a ¾-ounce jighead. This past December, however, I fished in heavy current following three or four inches of rain, and conditions forced me to adjust. Heavier-than-normal current calls for a heavier presentation. In situations like that, I will take a lead slip sinker – say a 5/16-ounce bullet-nose sinker, and put it ahead of the lure. The water is dirty after a heavy rain, and in that faster current the fish get just a quick glimpse of the bait as it rushes past them. The weight and extra bulk doesn’t hurt the presentation at all. It does, however, help me get that swimbait down and working in the fast current. Fishing across large flats on big rivers and below dams calls for long casts. It requires equipment that not only enables you to make those casts but to set the hook successfully even with all that line and current between you and the fish. I use a long rod with muscle, a 7′-4″ Dobyns DX in heavy action. It has a good flexible tip that helps you make long casts, but at the same time it has the backbone to drive the hook home even with the heavy diameter wire on my jigheads. My line choice is 15- to 17-lb fluorocarbon. That fluorocarbon helps me get down in the current better because it sinks, and the low stretch helps me get a good hookset. My reel is a Lew’s Tournament Pro with a 6.4:1 gear ratio. It also aids in casting long distance and the high-speed gear ratio helps me stay in contact with the swimbait. The Tennessee River and its fabled impoundments have a lot of challenging current areas that are loaded with big smallmouth. Try these tips for rigging and working the Yum Money Minnow for the fast water. When it comes to big smallmouth, I probably catch more 5- and 6-pounders on this bait than on anything else! This entry was posted in Bass Fishing, How To Fish on April 21, 2014 by ronniegarrison. The weather guessers said the weather would be nice the end of last week so I headed to my place at Clark’s Hill Wednesday afternoon. I needed to check to make sure everything was ok because I was afraid pipes may have frozen but wanted to fish, too. And the guessers were right – Thursday and Friday were beautiful. I lucked out – no pipes were busted and no limbs from the pine trees around my trailer had fallen in the ice storm. But the bass didn’t seen to know conditions were perfect. I got two bites and landed one bass on Thursday and never got a bite on Friday. 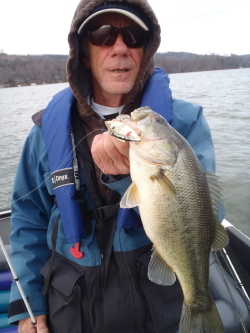 The water temperature ranged from 54 to 65 degrees and should have been ideal for the bass to be feeding. The water was muddy but that is not unusual. But I fished many of my favorite places and the bass just were not there. Fishing and staying at my place at Clark’s Hill always brings back great but bittersweet memories. I fished around the cover where daddy, mama and I spent countless days pulling crappie out of the button bushes. And in the trailer are their favorite chairs, empty for many years now since they both died 14 years ago, but I can still see them sitting there and talking to me. I fished around an island where my first dog, Merlin, got out one day and tried to dig a beaver out of a clay bank. It took weeks to get all the Georgia red clay out of her coat. And I fished the rocky bank where I used to tied the boat in the summer and throw sticks for here to retrieve, and she would even bring back rocks I threw if they were in less than a foot of water. I could never understand how she found the rock I threw among all the others, but she always found the right one. It broke my heart when she got where she could not stand and I had to have her put down when she was 14 years old. Dogs never live long enough. I fished the docks at the boat club where I spent thousands of hours skiing when I was younger. Now my old body won’t let me water ski. The last time I tried about a 20 years ago my muscles hurt so bad I could hardly move for a week. And I fished the cove where I shot two deer from my boat over Christmas holidays one year. I always spent the two week school holiday there, fishing, building brush piles and hunting. I was often by myself for days in a row, just me and Merlin. Fishing has got to get better over there soon, but the memories will always be perfect. This entry was posted in Fishing Ramblings - My Fishing Blog, Fishing With Family and Friends on April 19, 2014 by ronniegarrison. Tim’s Ford Forecast – Over the past few weeks, we’ve enjoyed a good Jig, crankbait and Carolina rig bite in 5 to 25 FOW. Water temperatures improved to the 59-62 degree range, moving Smallmouth and Largemouth alike to their spawning areas throughout the lake. Crappie action is good on docks and brush in the 10-20 FOW range. Concentrate early on main lake points working your way back into pockets a short distance close to the spawning areas. Probing main lake gravel rounds and flats with Rapala DT-10 and DT 20 crankbaits, Missile Baits Fuse 4.4 on a Carolina Rig and Tightline Football Head jigs are a great way to boat a monster fish. Watch for the top water bite to explode on the lake in May as we see the shad spawn start around the second week of the month. A good indication the shad spawn has started is large schools for shad running the rock banks and around dock on the main lake. As a reminder, please wear your PFDs and beware of your surroundings, boating accidents can happen to anyone! Make your reservations now for some great spring action on Guntersville or Tim’s Ford. This entry was posted in Fishing Reports on April 17, 2014 by ronniegarrison.